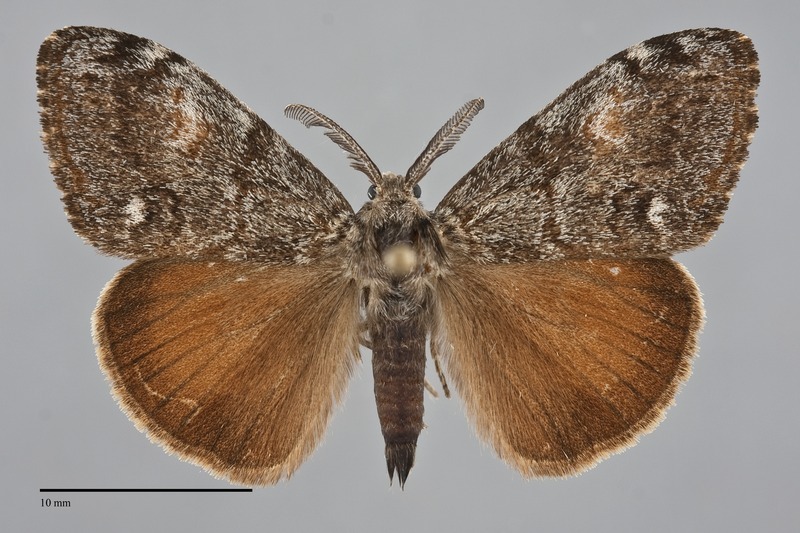 Orgyia pseudotsugata, the Douglas-Fir Tussock Moth, is a common and widespread Orgyia with dark brown gray forewings and rusty brown hindwings. 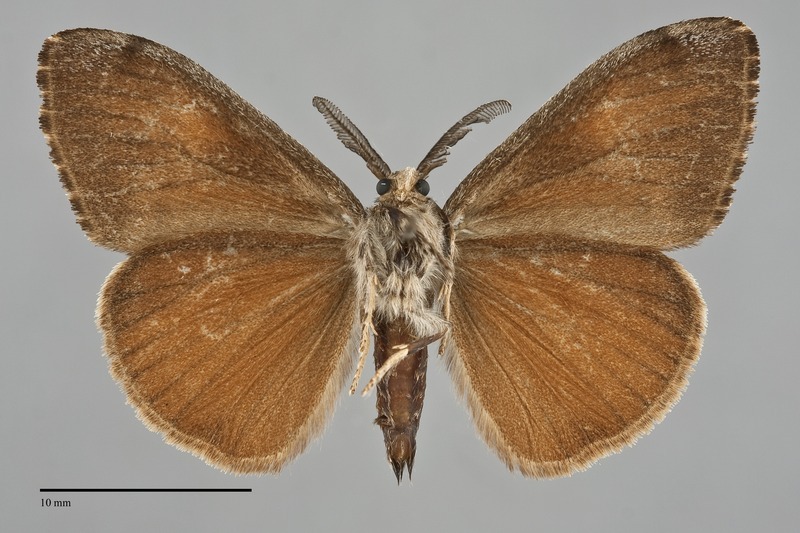 It is slightly larger than our other tussock moths (FW length 14–18 mm; wingspan 3.0–3.5 cm; females lack wings) and has a more elongate forewing. The forewing has a blunt apex and nearly straight outer margin. It is dark gray-brown variably dusted with gray, especially in the median area. The dark gray antemedial, postmedial, and subterminal lines are dark brown that is obscure in uniform specimens and more prominent in heavily dusted ones, single, and gently waved. A large discal spot is broadly C-shaped, outlined in indistinct red-brown reniform and filled with more prominent paler gray, rusty, or light ochre scales. A light gray to white subanal spot is located in the posterior subterminal area slightly above the posterior margin. 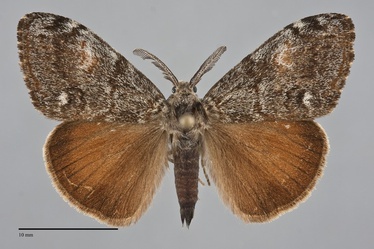 The hindwing is rounded, orange-brown with a darker gray-brown marginal band. The head and body are powdery gray. The male antenna is short and broadly bipectinate. The female has vestigial pad-like wings and is heavy-bodied and nondescript. This species can usually be identified by its short and broad wings, dark forewing, rusty hindwing, and short and broad male antenna. It can be told from Orgyia antiqua—the other common Orgyia in most of our area—by its forewing color, lighter rusty brown in O. antiqua. Orgyia cana and Orgyia vetusta have more similar gray forewings but are both restricted to the southern part of our region. Both of these species have more convex outer wing margins, are lighter brown or gray on the forewing, and browner with less of a marginal band on the hindwing. 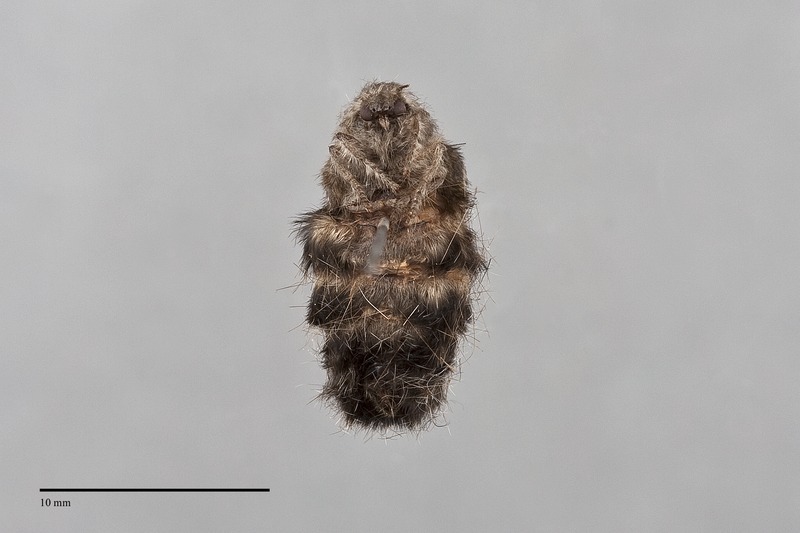 Females of O. pseudotsugata can be told from O. antiqua by their narrower antennal pectinations, twice the shaft diameter in O. antiqua, but are indistinguishable from the females of our other Orgyia species. The nominate subspecies O. p. pseudotsugata is found throughout most of our region. Ferguson (1978) named subspecies O. p. morosa for melanic populations along the Pacific Northwest Coast but noted that there was evidence for intergradation with O. p. pseudotsugata in areas of central Washington and northeastern Oregon. Larva is black and densely covered with white hair tufts, combined with four very long dorsal white and yellow hair tufts. It is illustrated by Miller & Hammond (2003). This species is widely distributed throughout much of western North America in various types of coniferous forests. It is generally rare to absent west of the Cascades, but is common to abundant in the drier forests east of the Cascades where it frequently expands into epidemic outbreaks that result in widespread defoliation of coniferous forests. This species is found in forests throughout the Pacific Northwest south of southern British Columbia. It is most common in dry forests east of the Cascade Mountains but occurs in wetter west-side locations. It can be found in steppe habitats away from its conifer foodplants during outbreak years. Orgyia pseudotsugata is widely distributed in montane Western North America. The range extends south to southern Arizona and California. This species is a foodplant specialist on conifers (Pinaceae), and particularly favors Douglas fir (Pseudotsuga menziesii) and true firs (Abies spp.). This species is primarily found in late summer and fall, most commonly in August and September. The males are nocturnal and come to light. Like other species the females are sedentary and lay their eggs on the cocoon after mating. 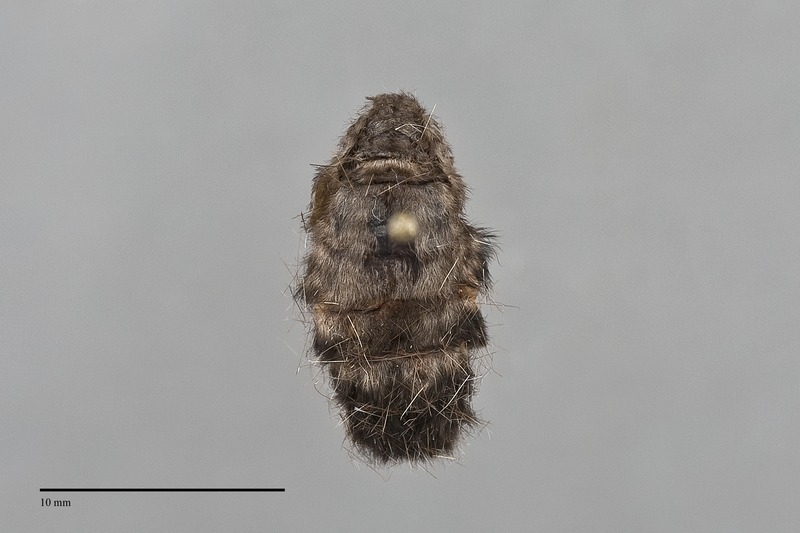 Orgyia pseudotsugata is a major pest of conifer forests, especially in outbreak years when massive defoliation may take place.